With the U.S. Anti-Doping Agency having recently made new (and vigorously denied) accusations against the record-breaking seven-time Tour de France winner Lance Armstrong, it’s tempting to imagine the annual cycling race dampened by scandal when it gets under way this weekend. But, in reality, the accusations came as little surprise to those familiar with the history of the sport. Pick any Tour de France in recent memory and a cloud hangs over the final standings. 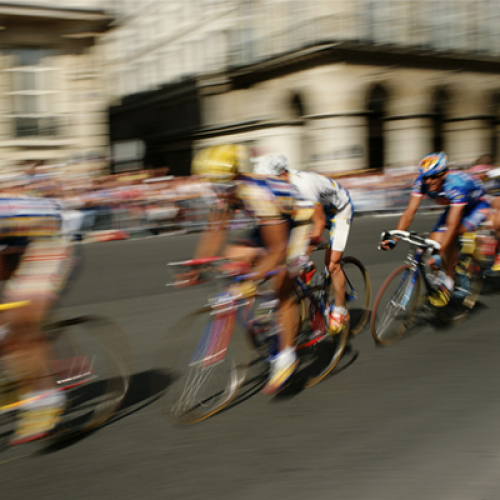 Six of the first ten finishers in the 2005 Tour have been accused of doping; 13 riders, including two of the favorites, were expelled from the 2006 Tour before it even started. Indeed, were Armstrong to be found guilty, it would mean that only two (Cadel Evans and Carlos Sastre) of the past 16 first-place finishers remained unimpeached on this front. Is the opprobrium that these accusations have aroused justified? Athletes regularly use extreme physiological enhancement techniques to improve their body. So what’s so bad about chemical enhancement? The arguments against doping can be broken down into three basic categories: doping harms athletes, it harms an athlete’s rivals by providing an unfair advantage, and it undermines sport in society. But for all of these arguments, there are counterarguments. Let’s take the first—that doping harms athletes. Doping may be one of the lesser evils imposed upon elite athletes’ bodies. In some sports, such as boxing, the risks are self-evident. However, it is a rare professional sport that is not harmful to an athlete’s health. The average career for an American football player, for example, is less than four years, with injury being one of the main reasons for this brevity. Moreover, it is legal to use drugs that actively increase this harm. Athletes regularly take high doses of anti-inflammatory drugs to recover quickly from injury, only to suffer intense side effects of this medication. Drugs create an unfair advantage, but this cannot be the sole reason for banning them. Doping is just one form of gaining an edge over competitors. The British team that dominated track cycling at the Beijing Olympics in 2008, claiming seven of ten gold medals, had a well-funded and well-oiled support infrastructure, which included superior, though completely legal, equipment. This was termed “technological doping” by its critics. What is the difference between drugs and technological doping? In both cases, those in the know—those with the best resources—get an inside line to success. However, the rules target and punish the use of drugs. If the rule-makers were really serious about addressing “fairness,” they would need to address much more than just the use of drugs. Does doping undermine the integrity of sport in society? This is an area that vexes many philosophers. At one extreme, the Harvard bioethicist Michael Sandel argues that enhancements have the potential to corrupt athletic competition as a human activity. His Oxford counterpart, Julian Savulescu, argues that enhancement is not against the spirit of sport; in fact, the desire to be your best using whatever means possible is the very essence of that spirit. The philosophers are divided—as are the players. In some cases, notably golf and snooker, it is still expected that athletes will call a “foul” on themselves when they play a false shot, even if the referee does not notice it. This is unheard of in soccer—the most famous recent example being the double handball by the French player Thierry Henry in 2009; unseen by officials, it effectively knocked Ireland out of the World Cup. The “spirit of sport,” therefore, is already widely variable in its character. Is allowing doping the obvious answer to the “problem” of drugs in sport? Bringing pharmaceutical enhancement into the open would be less hazardous for athletes. Allowing controlled doping would also reduce cheating—no more would we think a gold medalist had broken the rules, as there would be no rules to break. Drugs would lead to enhanced sporting performances and a more impressive spectacle. And yet, this libertarian solution is a mirage. It is both practically impossible and politically unworkable. Most drugs banned in sport are either available by prescription only (e.g., human growth hormone and the blood oxygen booster erythropoietin) or are controlled substances (cocaine, heroin, or Ritalin). In many countries, just possessing some of these substances can result in criminal charges. These drugs would presumably have to be prescribed by doctors affiliated with a country’s sports federation. But there would be no legitimate health reason for this prescription, just the chance of a gold medal—an obvious clash with the Hippocratic oath. Promoting the use of a controlled drug would surely be politically impossible. It’s also not clear that a level playing field could be achieved by enabling free use of just specific, approved doping methods. Performance enhancement is a constantly shifting field. There are many potential as-yet-unknown drugs and methods. The only question, then, is where the line should be drawn. To consider the difference between a free-for-all doping environment and a regulated one, think of the contrast between Indy racing and Formula One. In Indy, the cars are very similar—driver skill largely determines the winner. In Formula One, the cars all perform differently. Driver skill is irrelevant unless backed up by the best car. The current rules mimic the Indy car situation. And I think the public favors this arrangement. As a sports scientist, I prod, poke, and measure elite athletes all the time, but I would feel uncomfortable treating them as human Formula One cars to be manipulated by the full force of the pharmacopoeia. Professor Chris Cooper is Director of the Centre for Sports and Exercise Science at the University of Essex, and the author of Run, Swim Throw Cheat. He blogs on this topic at www.runswimthrowcheat.com and tweets at @profchriscooper.